Hello! My name is Mark Dixon and I created Blue Lens right here in Pittsburgh, Pennsylvania to embody my work as a filmmaker, videographer, photographer, media consultant, and public speaker. It would be my pleasure to work with you. As evidence for global warming and resource depletion moved into prominent view on an international scale, Mark decided to refocus his life on tackling those issues, launching YERT – Your Environmental Road Trip in 2006 with his college buddy, Ben Evans. Mark (as Producer) and Ben (as Director) ultimately created a feature film documenting the YERT adventure, which has been enthusiastically screened by dozens of film festivals, colleges, and community groups around the world. The YERT project has been featured in notable press outlets including the San Francisco Chronicle, the Huffington Post, the National Catholic Reporter, and Pittsburgh’s own City Paper. YERT has also earned numerous awards, most notably Audience Awards at the San Luis Obispo International Film Festival and the Environmental Film Festival at Yale. YERT – Your Environmental Road Trip was picked up for distribution in the U.S. and Canada by First Run Features and continues to screen around the world. Distribution outlets include Netflix, iTunes, Amazon, and YERT.com. Mark’s efforts on YERT also moved PennFuture to name him a Citizens Choice Green Power Hero in 2011. In 2011, Mark received PennFuture’s “Citizens Choice Green Power Hero” award for his work on the YERT film and was featured in the cover story for the Spring 2014 edition of Bridge to Light magazine. Mark’s most recent film, “The Power of One Voice: A 50-Year Perspective on the Life of Rachel Carson,” was accepted into the 2015 American Conservation Film Festival, the 2015 Woods Hole Film Festival, and the 2015 AASHE Conference (Association for the Advancement of Sustainability in Higher Education). Mark is currently working on several more environmental film projects, including documentaries on air quality and environmental justice (with overlap to be determined). He is also working on multi-year documentations of the Green Building Alliance’s Green Schools Academy and the South Side’s Schwartz Living Market renovation to Living Building standards. Mark’s films and public speeches have inspired audiences around the world, including TEDx Pittsburgh, Sony Pictures, U.S. Environmental Protection Agency, Phi Beta Kappa Society, Bioneers Conference, the Mother Earth News Fair, Carnegie Science Center, and the world’s oldest film school: Russia’s VGIK (Gerasimov Institute of Cinematography). In December 2015, Mark crowdfunded a journey to Paris, France to attend and cover the United Nations Climate Change Conference – Conference of Parties (COP21) as credentialed press (blog and videos at https://markatcop21.wordpress.com/ ). Mark also serves on the board of the internationally renowned Thomas Merton Center in Pittsburgh, Pennsylvania. Mark’s activism photography has been featured in a wide variety of media and outlets. His photo, “#’s Are the New Protest Signs,” is currently featured at the Smithsonian’s National Museum of African American History and Culture after first appearing in the online version of The Atlantic (link). Additional photos have been featured on BillMoyers.com, CommonDreams.org, NewPittsburghCourierOnline.com, InsideClimateNews.org, NCRegister.com, WESA.fm, and many other websites. You can browse all of Mark’s photos (most free to use via Creative Commons license: CC BY 2.0). A citizen of the world, Mark has lived on three continents and visited 26 countries, particularly enjoying a year in Tokyo, Japan. Mark has also entertained audiences on stage with choral and solo performances of jazz, comedy, gospel, opera, and classical music as well as improv and musical theater. Mark Dixon is an award-winning filmmaker, photographer, activist, and public speaker exploring the frontiers of social change on a finite planet. After graduating from Stanford University with a degree in industrial engineering, he worked for start-up companies in Silicon Valley before turning to documentary filmmaking. 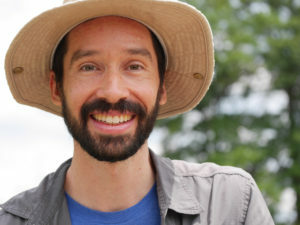 His productions include “YERT–Your Environmental Road Trip” (a year-long “eco-expedition” through all 50 United States exploring environmental sustainability) and, “The Power of One Voice: A 50-Year Perspective on the Life of Rachel Carson.” In December 2015, he crowdfunded a journey to Paris, France, to attend and cover the United Nations Climate Change Conference–Conference of Parties (COP21) as credentialed press (https://markatcop21.wordpress.com/). Mark is currently working on a new documentary entitled “Inversion: The Unfinished Business of Pittsburgh’s Air,” and his related advocacy and citizen science efforts caused Pittsburgh’s Group Against Smog and Pollution (GASP) to name him a Champion for Healthy Air in 2017. Mark has given presentations on environmental topics to diverse audiences including Carnegie Mellon University, Yale University, Stanford University, Sony Pictures, TEDx Pittsburgh, and the U.S. EPA. Mark also serves on the board of the internationally renowned Thomas Merton Center, and his activism photography has been featured in the Smithsonian’s National Museum of African American History and Culture. You can read more about Mark’s work at http://lens.blue/.